It wasn't until very recently that I started to get into perfume. In fact, it was probably only a year ago that I actually began to wear some kind of scent every single day. Now I'm addicted, as you can see. There's nothing nicer than having choice, after all! So here at my top five favourite scents for you all to enjoy, including two body mists, one cologne, one Eau de Parfum and one body crème. This gorgeous combination of pink honeysuckle, golden peach and Cyprus woods was my favourite scent for ages. It was actually given free when I visited Bath & Body in Dubai and is sadly a limited edition. However, you can still buy it on Amazon and various other websites by clicking the link! I wrote about this mist before in my 'Gifts from Abroad' post, and it's definitely become one of my favourites since I've started wearing it. It's perfect for summer, as the name would suggest and I literally smother myself in it's tropical fruity floral aroma when I go out for the day in shorts or a summery dress. VS also sell variations of this mist with different holiday titles like Ocean and Sunset, which are all very tempting, especially if you're going for a summery getaway. One of Victoria's Secret's newest fragrances, this perfume is my go-to for every day. It's an absolutely beautiful combination of apple blossom and freesia which makes me feel so uplifted every time I spray it on. It also lasts all day which is one of the main factors in a fragrance, obviously. I usually layer this over the top of my Rome Honeysuckle Amore mist for a long-lasting, floral attack on the senses (that sounds violent, but it's a nice attack, like a summer breeze). This product is actually a cologne and I would have never picked it out myself if it weren't for my mama, who said that it was nice and I should trust her. Can't argue with her really. This is much more of a warm, musky smell which is perfect for autumn and winter, so has recently been less used. However, that doesn't distract from how gorgeous the smell is. My only complaint about this product would be that it doesn't last very long, as it is a cologne, so you have to put quite a lot on. But, it is a lot cheaper than regular VS perfumes, so is worth it for the budget price. And yes, I know the majority of this list consists of Victoria's Secret products, but I love them, so I can't lie! This is definitely in the running for my all time favourite smell ever. I was given a taste (or a sniff!) of this product when I was given a complimentary hand and arm massage at the Jo Malone store in Brighton, and this was matched to my own personal fragrance palette. My product is a stunning floral body crème which I use as a day to day 'perfume'. I love that it works as both a moisturiser for my neck and chest and also releases the beautiful smell. I would also recommend this for hot, summer days, as the scent becomes even more powerful when your body gets hot. Hopefully, I shall get this in the cologne when I run out! Obviously, these are just my top picks, but what are yours? 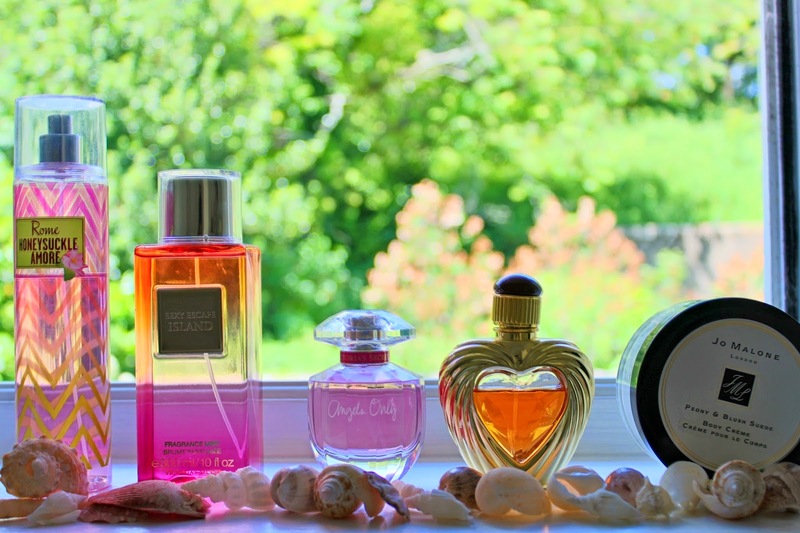 What's your go-to Summer scent?